Lysosomal Staining Reagent - Blue | Cytopainter (ab176825) is part of a series of new fluorogenic probes to label lysosomes of live cells. The proprietary lysotropic dye selectively accumulates in lysosomes probably via the lysosome pH gradient. The lysotropic indicator is a hydrophobic compound that easily permeates intact live cells, and becomes trapped in lysosomes after it gets into the cells. Its fluorescence is significantly enhanced upon entering lysosomes. This key feature significantly reduces its staining background and makes it useful for a variety of studies, including cell adhesion, chemotaxis, multidrug resistance, cell viability, apoptosis and cytotoxicity. It is suitable for proliferating and non-proliferating cells, and can be used for both suspension and adherent cells. Lysosomes are cellular organelles which contain acid hydrolase enzymes to break up waste materials and cellular debris. Lysosomes digest excess or worn-out organelles, food particles, and engulfed viruses or bacteria. The membrane around a lysosome allows the digestive enzymes to work at pH 4.5. The interior of the lysosomes is acidic (pH 4.5 – 4.8) compared to the slightly alkaline cytosol (pH 7.2). The lysosome maintains the pH differential by pumping protons from the cytosol across the membrane via proton pumps and chloride ion channels. 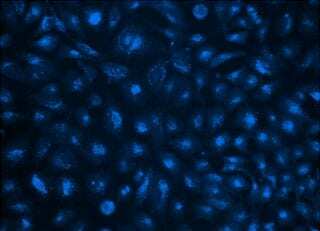 Image of U2OS cells stained with Abcam's CytoPainter LysoBlue Indicator Reagent (ab176825) in a Costar black wall/clear bottom 96-well plate. ab176825 has not yet been referenced specifically in any publications. Publishing research using ab176825? Please let us know so that we can cite the reference in this datasheet. There are currently no Customer reviews or Questions for ab176825.